By reducing the product pipeline it is possible to respond quicker and react more efficiently to the requirements of your customers. The QR operations strategy is focused on using multiple enterprises and business processes to make sure that products are developed and replenished quickly. The aim of QR is to increase sales and to reduce costs, inventory, and the risk of losing revenue. A value chain needs to be redesigned in order to show speed and response as well as flexibility. There are two sourcing options. Quick Response using domestic suppliers is reviewed against the alternative which involves using offshore suppliers. Offshore suppliers provide cheaper labor costs yet the time it takes to arrive can be lengthened, increasing the chances of lost revenue. Quick response using domestic suppliers increase costs for the company but the lead times are reduced. If you are using the offshore strategy you will need to ensure the costs are reduced when it comes to the materials and products. As the lead times can be longer the risk of losing money is higher compared with domestic response but it can work with the right logistics behind you. Contact us today and ask about our shipping services. In order to position quick response strategies you need to be flexible and ready to respond. Your stock must include a wide range of products or services that can be brought to the market in the right quantity with the right varieties, price and time. Quick response, or QR, makes it possible to use demand to make the right decisions that will arrive in time for the customer; therefore, in fashion and other industries these decisions need to be left to the last possible moment. 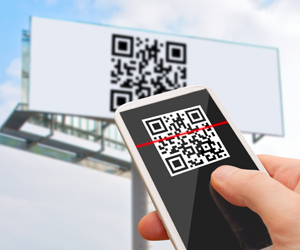 Flexibility is so important when it comes to QR. You need to be ready t o change quickly to keep up with the volatile market. QR involves an operations strategy as well as operational procedures that are all aimed towards working with multiple enterprises trough fast information transfer that is profitable for all of those involved in the mutual network. Research shows that QR needs to have strategic underpinning along with the implementation of technology and operational procedures in order to benefit the organization. Failure to effectively manage QR can lead to problems with the overall performance of the company which is risky especially in the current economic climate. The ability to meet customer demand is important in any market. You need to be able to provide the goods as and when they are required. 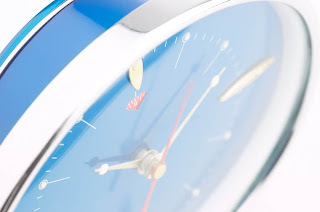 Time to market and time to serve adds problems to the time the companies are able to react and these needed to be shortened in order to increase the time it takes your company to react. The challenge in fashion is to be able to spot the trends and discover what the real demands are. When it comes to supply chains orders are key, the batch orders that are placed are created by the short lifecycle forecasts and the speed of inventory replenishment and this can cause companies to lose sight of the final market. Inventory can be misleading when it comes to demand because of the multiple inventories on the shelf all the way to the suppliers and wholesalers the demands are lost and it is not possible to create a system that will alter with the customer. 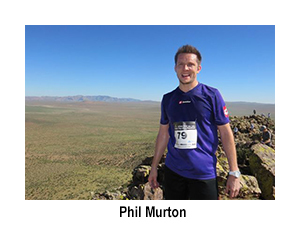 Following on from the recent participation in the Outward Bound Adventure race held in Hong Kong in March, a few Royale staff, it seems, have got the bug for putting themselves through painful physical challenges! Having always wanted to visit Mongolia after seeing it numerous times on NatGeo and such like, I decided to register for the Action Asia Ultra Marathon. 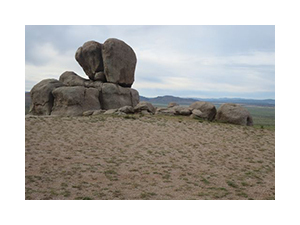 The event which takes place at the end of June consists of a 3 day 60km run/hike through the plains of Western Mongolia approximately 300km to the west of the capital Ulaan Baatar (UB). Further interest was drummed up in the office and the final team of intrepid hikers consisted of John Fawcett, Dean Locke, Wayne Griffiths and myself along with a couple of non-Royale members in the form of Geoff Knoell and Peter Hymns. After 7 hours of flying via Seoul due to an insistence not to fly on local carrier MIAT (!) we arrived in UB excited at what lay ahead. A brief stay in a downtown hotel which unfortunately refused to serve alcohol due to presidential elections that day, meant we were off to a healthier start than perhaps had been anticipated. The following afternoon we boarded a bus to head west into the plains. The stunning scenery and wild horses made for interesting viewing but as we approached the four hour mark we were all getting rather bored. That was, until, the quality of the road surface took a decided turn for the worse. Little did we know but Mongolia is the world pot hole capital and soon our bus driver was swerving wildly around the potholes/canyons but seemingly not easing off on the accelerator either! 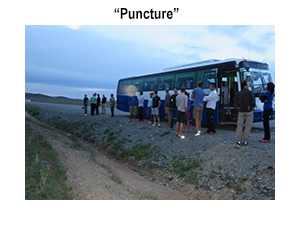 We could picture the headlines, “Brits killed in Mongolian bus crash horror!” Being Brits however, we sat resolute with our stiff upper lips and carried on regardless, that was until the bus developed a puncture and we were stranded roadside approximately 200km from the nearest settlement. After giving the offending tire a few exploratory kicks our driver began to jack the bus up and replace it with a spare from 1962. We reboarded and hoped/prayed we would make it the last 100km in one piece. 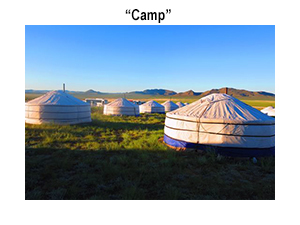 Eventually, having been travelling for some 7 hours, we finally made it to base camp and lugged our cases of tinned food to what would be our accommodation for the next 3 nights, a traditional Mongolian “Ger.” The Gers were surprisingly well equipped with proper beds and the camp even had hot water showers and flushing toilets so we were suitably relieved (excuse the pun) having been told to expect the worst. After a patchy sleep we were up at 0600 for the first days race. The 60km race consisted of 3 days of roughly 20km per day. The first day proved to be fairly manageable will only a few climbs and with the sky overcast temperatures were favourable and the course was polished off in 3-4 hours. Day 2 saw a more challenging route with a steep climb and also some energy sapping hiking over sand dunes. 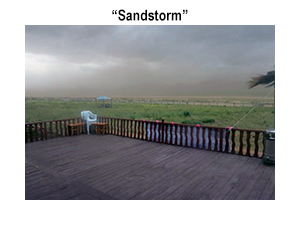 For the unfortunate Geoff (who was doing the longer 100km race) day 2 also consisted of a violent sandstorm that rolled through the valley whilst Royale team members were safely back in the camp sipping on their Mongolian beers. It was like a scene from ‘The Mummy’ and Geoff finally emerged somewhat sandblasted and rather shocked by the whole experience! 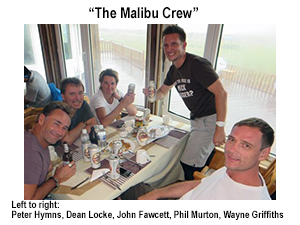 A few Mongolian beers turned into a few more and before long Murton had purchased a bottle of Malibu. Several hours later and rather the worse for wear we were christened by the other race participants (who took things rather more seriously) as “The Malibu Crew,” a moniker which we were all quite proud of! The final day’s race started at an ungodly 0530 and the team all crossed the finish line a few hours later with a suitable sense of accomplishment with Fawcett coming first in his age category. His 1st place certificate has since been emailed globally and framed in gold! All that was left was a perilous 5 hour bus journey at ridiculous speed and we departed the land of Ghengis Khan a happy bunch. Further races are planned in Royale’s 20th Anniversary year so we look forward to the next challenge that lies ahead! In the past the fashion industry has needed to place orders with their supplier’s months ahead of the season. The lead time was around nine months in total but this is not ideal when it comes to fashion. Demand changes which mean retailers can be left with stock that is no longer relevant in the current market. Stock outs are high, the cost of carrying inventory can be high and the lead time results in a long pipeline that isn’t suitable. One of the main problems with pipelines is the time it takes to serve. This is the point where the order has been placed and the documents relating to the order have been created. The documents and the orders are worked into the supplier’s processes and these in their own right can be long winded. Manufacturing times can be long and if it takes place on distant shores, the times are lengthened even more. More documents are required and the full container loads must be consolidated and clear through customs often after long times on the road. Costs in manufacturing and shipping need to be reduced yet if you don’t pay enough, the time it takes to receive the order is lengthened even further which can be self-defeating. Striking the right balance between cost and time to serve is critical unless you want to face forced mark downs and inventory carrying costs or obsolete stock. The first of the lead times that must be worked on in Fashion logistics is called the Time to Serve. As fashion demands change on a whim often in response to a celebrity spotting, a popular television show or even current affairs, fashion retailers need to be flexible and ready to spot potential money makers quickly. Jumping on board of these trends can be real money earners and so time to market is a vital lead time to focus on. You are dealing with a short lifecycle market. Once you spot a trend that is ripping through your target audience you must be able to transform these trends into the products that you can design, make and bringing them to market to be sold. This is known as the time to market and the shorter the time the better it is for you. Being slow means that you are likely to miss the trend completely, by the time your products are ready the trend will have passed and you will be left with stock that will not sell. Alternatively you will have missed the high priced opportunities and lose out on the potential profits as demand falls away and the market is flooded with similar products. In many businesses pipelines are managed with the creation of accurate forecasts. When it comes to fashion the market is extremely volatile. It is hard to forecast as demand changes quickly, trends move on and evolve so the products often have very short life cycles. 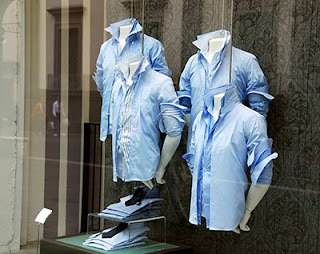 All of these factors mean it is very hard to apply the forecasting management technique into fashion retail. Time to React – How long you can adjust in response to a volatile demand. You need to either increase the flow or reduce it depending on demand. By focusing on these core elements and reducing the time it takes to complete each step, you increase the chances of keeping up and surviving in fashion retail. Return to learn more about each element in fashion logistics lead times. Fashion logistics has never been easy especially in recent years when the demands of the customer have risen. 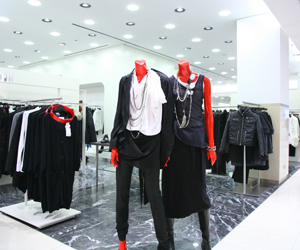 However, there is now an additional problem that put pressure on the shoulders of those working within fashion retail. This new problem is complex and tricky to master but it is possible. Products and materials are now more commonly sourced from overseas rather than the country that the business is based in. It’s a globalised world now but that doesn’t mean that organising the shipment of stock and the return of goods is any easier. Lead times can be lengthened extensively when sourcing from overseas yet the low costs of the labour and the materials themselves make this method of stocking shelves a viable one. Partnering up with an experienced fashion logistics provider is the best way to keep costs down and keep up with the fast paced fashion industry. Delays can be avoided by using the expertise of the couriers and pipelines to be reduced as much as possible. Some delays cannot be avoided with ease; you always need to account for the import and exporting procedures that take place at border controls. Yet with your fashion logistics providers behind you it is possible to have everything in place to reduce the delays and get your stock on time. To cope with our business expansion in Hong Kong, we've have moved to our new office in Kowloon Bay! Welcome to our Facebook page to view more photos on our new office. Have You Sorted Out Your Fashion Logistics? If you are in the fashion industry it is essential that you’re on top of your logistics. Competition is fierce in this market so if you want to compete, customer service should be a priority. Sometimes, just the basics need of sending orders out quickly and accepting returns can be difficult to master but with the help from fashion logistics providers, you too can ensure you are up there with the leaders with lots of happy and loyal customers behind you. Fashion is a difficult industry as trends change like the wind; it is hard to predict what will be a hot seller week to week. There is the need to have fast moving stock available in a r ange of options such as colours and sizes, yet you can’t risk being over stocked or under stocked. Feeling the pressure? This is a pressurised part of the fashion industry but if want to stay on top; you can’t afford not to get it right. 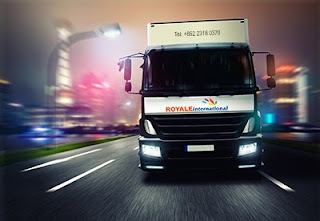 Contact Royale International and let’s discuss how we can help you take control of your logistics and gain those all-important happy customers. Alternative question Used to elicit an answer by forcing selection from two or more alternatives. 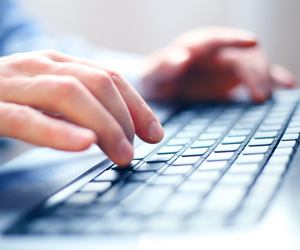 Clarification questions Reduce ambiguities, generalities and non-committal words to specifics. Confirmation questions Used either to elicit agreement or disagreement about a particular topic. Counterbiasing To attain sensitive information by making a potentially embarrassing situation appear acceptable. Inclusion questions Present an issue for the prospect’s consideration in a low-risk way. information-gathering questions Used to gather facts. Leading question Direct or guide a prospect’s thinking. Opinion-gathering Used to gather opinions or feelings. Reversing Used to pass the responsibility of continuing the conversation back to the prospect by answering a question with a question. Sharp-angle question Used to commit a prospect to a position. Statement/question A statement is followed by a question which forces the prospect to reflect upon the statement. Tie-down question Used for confirmation or to commit a prospect to a position. 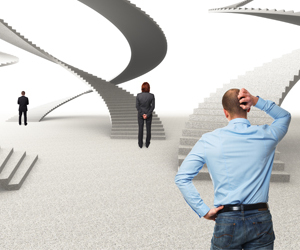 Transitioning Used to link the end of one phase to the next phase of the sales process. Source: DeCormier, R. and Jobber, D. (1993) ‘The counsellor selling method: concepts, constructs and effectiveness’, Journal of Personal Sales and Management. The fashion industry has to deal with the problem known as the lead time gap. This is the time it takes to source all materials, produce ideas and designs, convert them into products and get them onto the market place. The lead time is often much longer than the customer is comfortable with. The lead time gap is the time between the order cycle from the consumer time and the logistics pipeline. Long lead time gaps cause losses in revenue and often results in large mark downs on price tags being made at the retail level. These forced markdowns account for more than 14% of the total losses in retail. As a result the fashion logistics services have had to adapt in order to assist the fashion industry with reducing the losses they make and speeding up the lead time with quick response times. The lead time gap can only be shortened if the fashion industry is able to move quickly and jump on trends as they happen – turn around the production of products and ship them out quickly. Without fashion logistics this speed couldn’t be maintained and the job of satisfying customer demands would be impossible. Uncertainty in business is often dealt with by using forecasting. However when it comes to fashion forecasting is not always accurate. Short life cycles cause many problems with forecasting and so it is down to fashion logistics to come up with ways of coping with uncertainty and making fast changes to cope with trend rises and falls. • Time to market – the time it takes to seeing a potential opportunity and translating it into a product that can be sold. • Time to serve – How long it takes for customers to place an order and to deliver their order in a time period the customer will be satisfied with. • Time to react – The time a business is able to respond to the volatile demands of the customer. In the fashion industry it is essential to be able to spot trends and respond to them by creating suitable product lines as quickly as possible. Those failing on speed are faced with missing excellent sales opportunities and find themselves with excess stock that won’t shift as the products arrive after the interest has died down. In order to manage time to market companies have to be focused on being more flexible. Reducing the sizes of each batch in the manufacturing department and using CAD and CAM helps to ensure product changes can be made throughout the season and the duration of the cycle. In the past orders were made months ahead, around 9 months approximately. The time it takes to deliver the goods is not really the problem; the problem lies in the time it takes for orders to be placed and the suppliers’ processes. Batch based production methods contribute to long pipelines and each process has to be managed effectively to reduce stock outs and obsolescence. As these cannot be banished completely the need for excellent reverse logistics continues to become more valuable in fashion logistics with each passing day. In an ideal world every brand will be able to respond to the demands and orders of their customers instantly. However there are barriers that get in the way such as the long lead times between time to market and time to serve. It is vital that the reaction time for those in fashion is extremely fast and responsive. Keeping an eye on trends is an hourly job and spotting the changes can gave a huge effect on the success or failure of the products. • Short life-cycles cannot be avoided. Products are often design to capture the trends and times of the moment and therefore can be short lived. These products may be inspired by the weather, television shows, stars and celebrities. These are highly volatile products and what’s hot one day can quickly become something that’s not how the next. • High impulse purchases are made at the point of purchase. The buyer has not intended to buy these products but they have been stimulated to buy. These products need to be available to all in order to maximize the sale potential. Short life-cycles and high impulse buying contribute to the extreme pressures found in fashion logistics. There is a high risk of brands being over or under stocked and logistics has to play a swift role in dealing with these problems. With the number of products now being produced for brands outside of their own countries of origin logistics is now faced with longer lead times. The longer pipelines are also caused by the time it takes to process internal systems and importing and exporting. This is why third party logistics providers are able to work with the fashion industry to improve speeds and cost efficiency throughout the entire supply chain. When looking at the new supply chains in fashion logistics it’s necessary to pay attention to the downstream as it has a direct influence on the chains. The costs of having garments in store are high. Therefore it is necessary for stores to have low stock amounts of the goods that are turned around quickly. Any items that are not selling or which have become outdated need to be removed quickly. This along with difficulties at the SKU level is why a distribution center is now more important than ever. Reverse logistics therefore plays a high role in fashion. In the past reverse logistics would only take place at the end of a season but because trends move so quickly they now take place all year round. Reverse logistics in poor selling garments often involves moving the items to new geographic locations where they can sell better – this is often a preferred system as it doesn't involve reducing prices in a bid to sell poor performing stock. The supply chain in fashion has to be controlled from manufacture to the consumer. 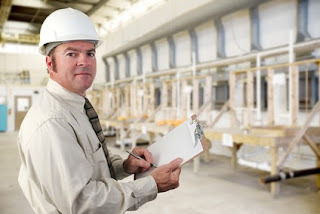 This requires proper tools, excellent management and real time inventory management in each section of the supply chain. All fashion brands that have a good level of control over their supply chain using fashion logistics are seeing the biggest growth rates. To do this is it essential to be able to have complete control of the customer and the manufacturer. Third party logistics companies can help any brand achieve this level of control. Those firms that work this method of operating into their everyday business will be the most successful and find themselves in much stronger positions compared to those that only focus on one area of the supply chain. • Shorten lead times – the transition from manufacture to delivery is now tighter than ever. This is good news in fashion logistics as the uncertain SKUs can be tailored for. • The use of a double supply chain is on the increase. There are two supply chains, one driven by the cost which is used for basic products that are frequently required. The second chain is more trends focused and concentrates of short production times, flexibility and speed – a must for fashion. • Quality control is an aspect that has to be paid attention to when lead times are so short. Outsourcing the quality control or managing it in-house will ensure that despite the speed of the manufacturing the end client will receive a good quality product. Due to globalisation the quality control is now often done at the point of manufacture as problems can be dealt with quickly. • Logistics operations are also increasingly being arranged at the point of origin of the products. 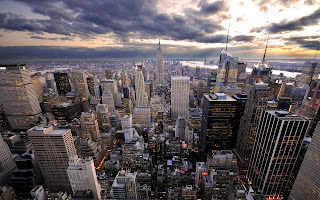 For example fashion brands in America and Europe are producing their goods in China. In the past these goods would be sent to distribution centres but now the operations take place in China who deal with quality control, value added services and distribution to ot her countries. After the products have been manufactured they need to be placed in storage. Additionally it is essential that all of the items have been tagged and added to the inventory so they can be managed and tracked throughout their entire time in the supply chain. They also need to be categorized into different categories such as size, color style, material or type. 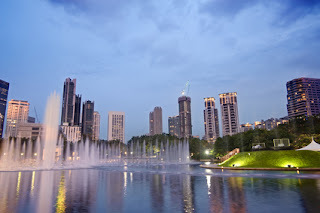 All of this information has to be done meticulously as any mistakes can cause losses, trouble when it comes to locating the items, delays and loss of revenue. The next step provided in fashion logistics is the physical act of picking the goods from the warehouses and packing them up ready to be loaded onto the transportation so they can be delivered to their next destination – be it a retail store, alternative warehousing in a different country or direct to a customer. This is known as order fulfilment and it’s not as easy as it sounds. The largest companies can have thousands of orders placed each day – all of which have to be picked, packed and delivered often within 24 hours. Fashion logistics is complex and requires great resources and strict management in order to make the process run smoothly. It is necessary for the fashion industry to pay close attention to their own supply chain capabilities. The movement of clothing and accessories is fast paced and it needs to be able to adapt quickly to the latest trends in the market. 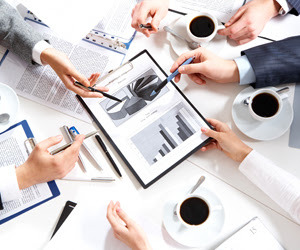 The changes constantly have to be monitored and catered for; failing to do so can lead to the decline of a business. 1. Unstable demand – unpredictability of future sales causes issues with the stock keeping unit level. These are caused by the fast changes in trends and the increased number of SKUs in the brands themselves. 2. 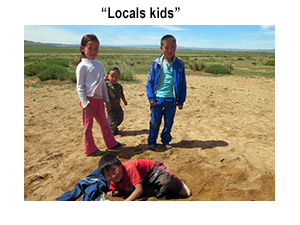 Globalisation and off shoring has made the world smaller opening up brand new markets all over the world. Therefore production locations and distribution is necessary for any firm looking to expand their market. 3. The industry as a whole has needed to become more flexible than ever, causing a rise in the use of third party logistics companies. 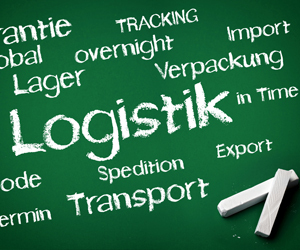 These logistics providers provide methods of being more flexible in all parts of the supply chain. 4. Garments are now becoming very outdated very quickly which again causes problems at SKU levels. 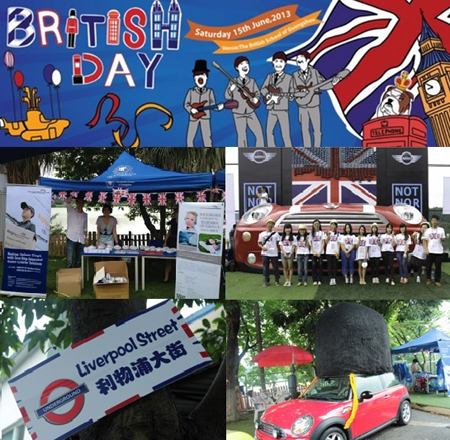 The British School of Guangzhou hosted its annual “British Day” on June 15, 2013 with over 3,312 attendees. 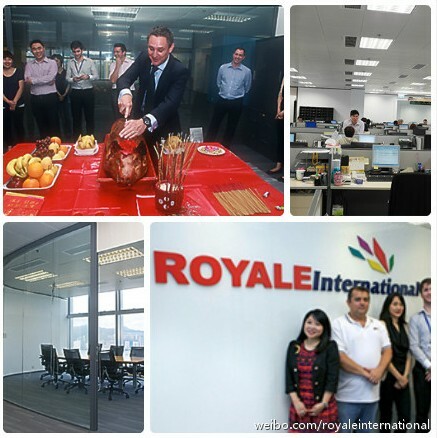 This year, Royale International Freight Forwarding Agency (Shenzhen) Ltd. joined the fun and was among one of the 70 stalls setup on “Oxford Street” for British Day. “British Day” organized by the British Chamber of Commerce and is held each year as a celebration the best of British culture, aimed to offer a day of fun activities, music, prizes and great food & drink to all participants. Some of this year’s “British Day” highlights included Beijing Beatles performance, a Best Hat Competition, Canton Cup Children's Football Tournament and a successful Guinness World Record attempt to create the largest union jack mosaic with 1,200 MINI toy cars. As the demand for warehousing and distribution continue to increase, the important role that fashion logistics plays has grown. Fashion logistics has been a serious player in the industry over the past forty years and is now getting the recognition it deserves. In the 1960s more attention was paid to fashion. Females moved away from making their own clothing and making clothes for the family and began buying readymade items. Therefore those selling fashion needed to find a way of storing more clothes and delivering them to the stores where they were to be sold. Since then the fashion industry has gone from strength to strength and the need for logistics has never been higher. The trend has now moved to smaller sized companies, many of which operate from small offices or even homes thanks to the use of ecommerce websites. Fashion logistics now helps large and small businesses by providing complete warehouse services; as well, as distribution, global deliveries and time critical services. Globalisation has also played its part in increasing the awareness and importance of fashion logistics, now it is being used by more people than ever before. Fashion logistics have been around since the beginning of the fashion industry . The phrase is associated with any company that houses, ships or markets the distribution of clothing and accessories regardless of whether the fashions are cutting edge or designer labels or not. As fashion became more a part of life for females in the 1970’s and 1980’s the need for logistics became indispensable. The logistics role involves providing warehouse space for the products that the company they are working with to sell to their customers. The logistics role then moves to shipping, once the order is placed, the items have to be picked and packed up and delivered. Many retailers are unable to perform these roles due to various reasons such as the lack of storage space, staff or vehicles; therefore, outsourcing and partnering with a fashion logistics provider is essential. Royale International Group provides fashion logistics services to clients all over the globe. Learn more by contacting us at inquries@royaleinternational.com. These steps can save around 1 to 5% of fuel compared with non-fuel efficient methods. There are ways of ensuring that retail deliveries are more energy efficient. 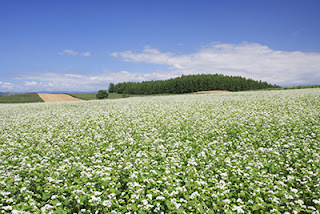 Using biofuels is one way of reducing the pollutants released into t he atmosphere as well as reducing the carbon footprint of the company. They are made from renewable plat materials or organic waste oils and fats. When these ingredients are blended with diesel or petrol they can reduce the emissions by around 20 to 50%. Replacing the vehicles used in distribution is another possibility. Using hybrid vehicles or electric vehicles it is possible to use logistics with almost no pollution being released into the environment. This option is perfect for domestic deliveries or when a large proportion of the distance to be travelled is located in rural or residential areas. The electric vehicles do need to take up energy in order to be charged so it is essential that companies look at ways of reducing the use of energy. One option is to use wind turbines to generate the energy that the batteries will use since electric vehicles have constraints when it comes to the amount of distance that can be covered per charge of the battery. It is essential that the vehicles have on-board energy storage options which will need to be set up to ensure the vehicles can complete the journey. What are the Environmental Impact of Retail Deliveries? Midal split which is the division of traffic between the various transportation modes. By reducing the use of certain freight traffic it is possible to reduce the carbon footprint of the company. Average handling factors which focuses on the measure of the average number of links that are used in the supply chain. The average length of the haul which is the distance the goods travel on each of the links in the supply chain. Average payload on laden trips and 4b– the average percentage run empty relates to the use of the vehicle capacities. Efficient use of energy is the ratio of distance that has been travelled to the energy that the journey consumed. Pollutant content of the energy source – considering the pollutants in the various fuels used in distribution. Environmental effects per truck per km. Any adverse effects of t he transportation that isn’t connected to energy consumption such as noise and accidents. There is no escaping the effects the environment has on retail logistics. 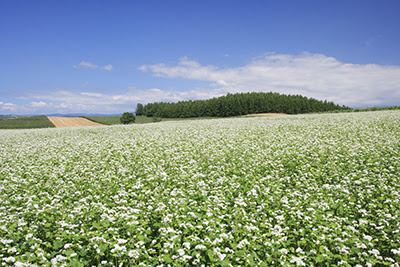 Environmental strategies being made by retailers need to work out ways of transporting goods in a way that is more environmentally friendly. There are 6 main effects that are being closely monitored right now, are you paying attention to them? Greenhouse gas emissions – Carbon monoxide is produced by the burning of fossil fuels in vehicles and in generation. Retailers also contribute to the gases by using temperature control equipment and therefore need to work out new ways of reducing their impact on the environment. Noxious gases – Pollutants including nitrogen oxide and sulphur dioxide have negative effects on the quality of the air. These gases can have negative effects on humans, vegetation and on the buildings. Noise pollution – Vehicles and distribution centres cause a lot of noise. With new vehicle technology it is possible to reduce the noise so retailers need to invest in their vehicles to ensure they have quieter engines. Accidents – freight transportation can cause traffic accidents and the cost of injuries or fatalities as well as property damage and use of emergency services are considered to be environmental costs. If the accident happens on the distribution premises it is an internal cost. 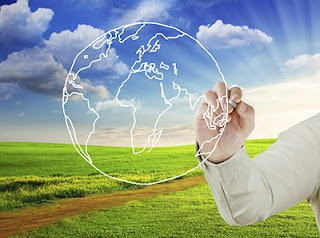 Waste management – Waste is a by-product found in retail and retail logistics. With much waste the landfills can be over filled causing environmental problems and the burning of waste adds air pollutants. Visuals – No one likes to see hoards of trucks and warehouses in their community. It can be intimidating especially in the rural environment. Coming up with solutions to these environmental concerns is essential for all retail logistics departments. There is a big difference between boutique and big box stores. Boutiques are unique and are able to provide an exciting and interesting experience, fantastic customer care and authentic sales touch. No matter how hard large stores try, it is impossible to recreate the feel and the atmosphere that are only found in the more personal boutiques that are popping up both on the high street and online. So how can boutiques retain their successes? Introducing technological experiences through digital signs. You can engage with your customers by offering ways for them to view your products and those that they have seen online using digital signs. Making the most of mobile ecommerce opportunities. Be forward thinking by introducing a brand new way of interesting and shopping using mobile ecommerce as a new purchasing option. Join forces with your peers and neighbours. The more you help each other the better it will be for everyone. Join forces to drive more traffic to your area b y joining or starting local community groups. Make your boutique social. Use social media to increase brand awareness and store visibility and stop trying to force sales to your followers. Use social media to reinforce your reputation and through that sales will naturally follow. Add online virtual wholesale buying experiences. Trade shows are beneficial but they can cost a lot of money and the frequent travelling can be exhausting. Offer an online way to show customers your goods using virtual dressing rooms, showrooms and marketplaces.